Like Dorothy on the road to Oz, navigating College can be daunting! Dorothy had a few companions, but in the Library you have many different people and many types of services to help you along your path. Not sure who or where to ask your questions? Douglas College has libraries at both the Coquitlam and New Westminster campuses. Look for the "ASK ME" service desk close to the entrances at either campus. There you will find friendly and knowledgeable library staff waiting to provide assistance. Don’t hesitate to ask your question - we answer all sorts of questions at the ASK ME desk. In addition to F2F help, the Library website has an array of research and educational resources to help you write research essays, find scholarly resources and complete your assignments. Are you simply looking for a book or e-book? Search our Library catalogue. Looking for citation styles? The library has Citation guides to help you cite your sources correctly. Familiarize yourself with the library homepage and don’t forget to click the Resources by Subject page for your specific discipline. Do you have required readings for a course? Check the Course Reserves link on the library homepage and try a search by course or instructor. Some readings are online and others are housed on the Reserves shelves at the circulation desks. Circulation staff can help you get the correct reading for your course. Staff can also help you sign out library material, book laptops, book study rooms, show you how to use audio visual equipment and much more. Information about the technology available for loan can be viewed on the A/V equipment webpage. Don’t forget: you can log in to your own library account 24/7. From your account you can place holds on library material, renew books/videos, opt in or out of your personal Reading History, create reading lists for research and monitor your account. Don’t forget to subscribe to Notices by Text Messaging so you will never have overdue materials. You will receive courtesy notices gently reminding you when your library materials are due, alerts when your holds are ready for pick-up, and other helpful text alerts. 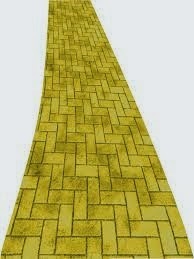 So don’t get stranded on the yellow brick road! Stop by either campus library and get to know the people, tools and services available for you - and no flying monkeys! More information about the library is available on the Douglas College website.